African football's most successful nation is nearing rock-bottom, amid concerns that they could be suspended by Fifa. The domestic league has been disrupted since February, following a deadly riot in Port Said. Fans have threatened to prevent the league's resumption unless there is a change of leadership within the Egypt Football Association. And it is plans for change which has come to the attention of Fifa. Hani Abou-Reida was seeking to become the EFA's new president, with elections to be held next month. But a court ruling has since prevented Abou-Reida from running for office, suggesting he is ineligible having served as an EFA official for two consecutive terms. Fifa takes a dim view of any government interference but is currently just watching and waiting. A Fifa spokesperson told BBC Sport: "At the time of writing we can confirm that Fifa is monitoring the situation in Egypt, though no further decisions have been taken with regard to the Egyptian Football Association." 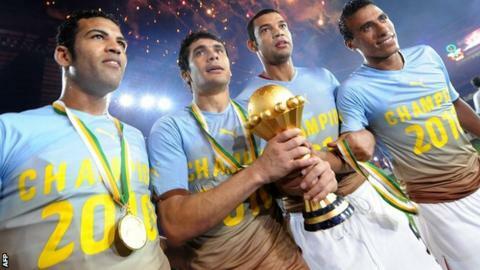 The national side lifted the Africa Cup of Nations trophy three times in a row, from 2006 to 2010. The seven-times winners failed to qualify for the 2012 or 2013 editions. League football has been suspended for almost eight months, and the proud footballing nation now faces the prospect of a ban from the global game.